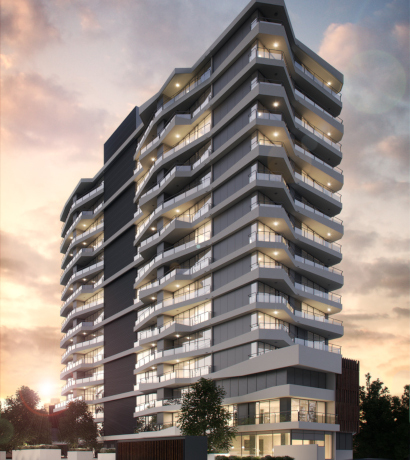 Designed by celebrated Brisbane architects Cottee Parker and built by RCQ Construction, one of Queensland’s most respected construction companies, Proximity Hamilton is a stunning 14-storey, 127-apartment tower in the exclusive Portside Wharf precinct. The building’s design was inspired by its proximity to the Brisbane River, and reflects the ripples created by a semi-submerged object in a flowing stream of water. Proximity’s Architectural design with the woven-effect balconies and striking vertical aluminium battens deliver an ever-changing façade. The battens are inspired by the skeletal hulls of boats and as the ribs of a boat change along its length, so too do these vertical battens change and warp along the length of the building. Subtle shifts in the spacing between each batten and subtle twists across each elevation add a sense of animation and individuality. Within the double-height lobby, residents’ mailboxes are created by Australian artist Brett Coelho and artistically dominate the space.